Instantly Command The Attention Of Everybody In The Room, Using The Breathtaking Technique Of Harp Harmonics On Your Acoustic Guitar! Some techniques you learn on guitar are complete game changers, and harp harmonics are certainly on of these. With their unique, magical, mesmerising sound, harp harmonics will immediately captivate your audience. You are in a room full of guitarists. Everybody is playing, doing the usual sort of stuff you’d expect to hear, and while it all sounds good, there is nothing particularly special that stands out. Wouldn’t you love to know a technique that will instantly command the attention of everybody in that room? Well, that technique is harp harmonics! The first time I ever heard anybody play harp harmonics on their guitar, my jaw dropped to the ground in amazement! I couldn’t believe the sound I was hearing. It was more like a harp, than a guitar. I knew right then, in that moment, I had to learn this technique for myself. Today I want to show you the mind blowing world of harp harmonics and how you can make these a part of your own guitar playing. You’ll never look at your guitar the same way again. 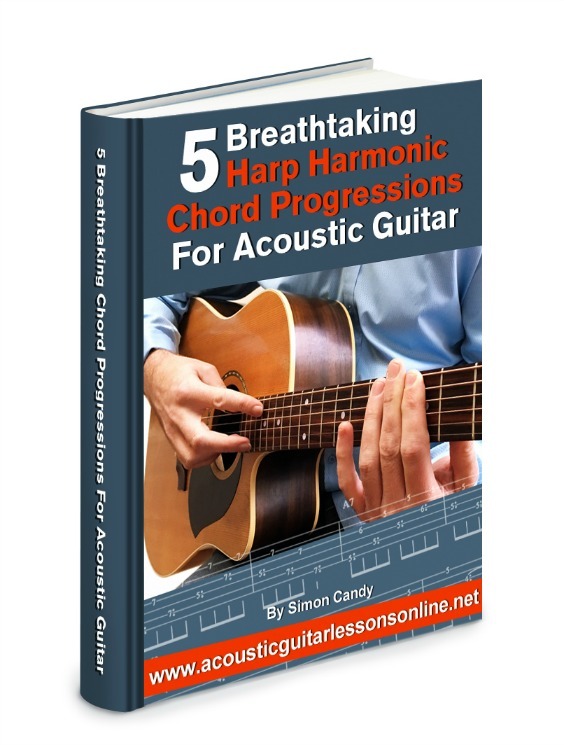 • Discover 5 mind blowing ways you can apply harp harmonics to the chord progressions you play on your acoustic guitar. • Develop a technique that will be as unique, creative, and impressive as anything you will ever do on your acoustic guitar. You’ll have the ability to blow people away with your harp harmonics the instant you start playing them! Get free instant access to your “5 Breathtaking Harp Harmonic Chord Progressions For Acoustic Guitar” ebook/video now. Simply fill out the easy form below, then click the “Give Me Access Now” button.